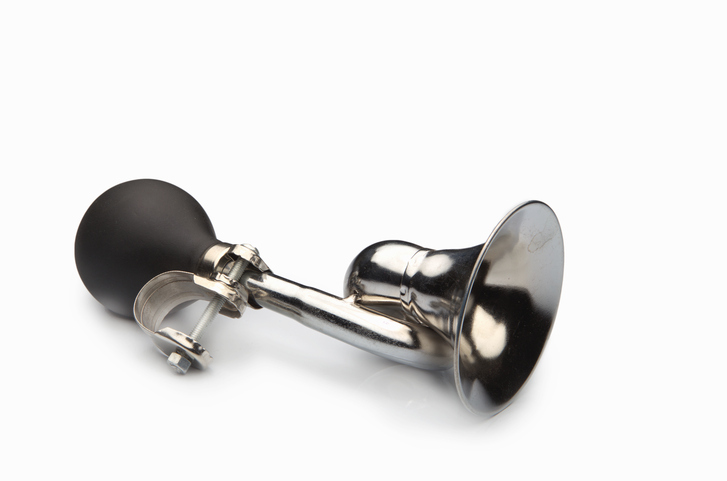 As a verb, to toot means ‘to make a horn or whistle make a short sound’ or ‘to make any sound that resembles that of a horn.’ As a noun, a toot is the act of tooting. In US English, as a slang term, toot means ‘cocaine’ and as a verb it means ‘to take a drug by snorting,’ but these meanings are now dated. Also dated, a toot is a period of drunken revelry in US English too. Informally, in Australia, a toot is a toilet, although, again, this term is somewhat dated now. The driver tooted her horn to get the other car to move out of her way. The elephant lifted its trunk and tooted when it saw the safari jeep. The trumpet player gave a couple of toots. The businessmen were tooting cocaine. The students had gone on a toot and they were all very drunk. I need to pee; where's the toot? As a slang term, a toot can also be the noise made when passing gas and, therefore, the act of passing gas itself. Toot dates back to around the year 1500. The verb, originally said of horns, likely originated by imitating the sound horns make, though its exact origin is uncertain. It is related to the Low German and German tuten, the Dutch toeten and the Swedish tuta, all of which mean ‘to toot.’ The noun, meaning ‘the act of tooting,’ dates back to the late 17th century, and comes from the verb. The Australian slang, meaning toilet, possibly came from a funny alteration of the word toilet, and appeared in the 1940s. The drug-related sense dates back to the 1970s.